First Lady Michelle Obama arrived in Phoenix in late October with most of the world, including American Babylon, thinking that the next President of the United States would be a woman. Of course, that didn't happen. We are left with President Donald Trump, a man who expresses a bizarre and deep disdain for women in general and women in who he deems have crossed him in particular. Those days in October were halcyon: the thing we were fighting and hoping against didn't seem a distinctly remote possibility. Reports have surfaced in the aftermath of the election that Hillary Clinton's campaign team knew that she would lose a couple of weeks before the election, but in October we were all woefully naive and inconsiderate of the scope of what a Trump victory would mean to the country. This collection contains photos and videos and podcasts from American Babylon's time at the Republican National Convention in Cleveland this summer. Most of these were shot in Public Square in downtown Cleveland, the rest are in the surrounding areas. All photos subject to full copyright protection and cannot be reproduced in any way without permission. 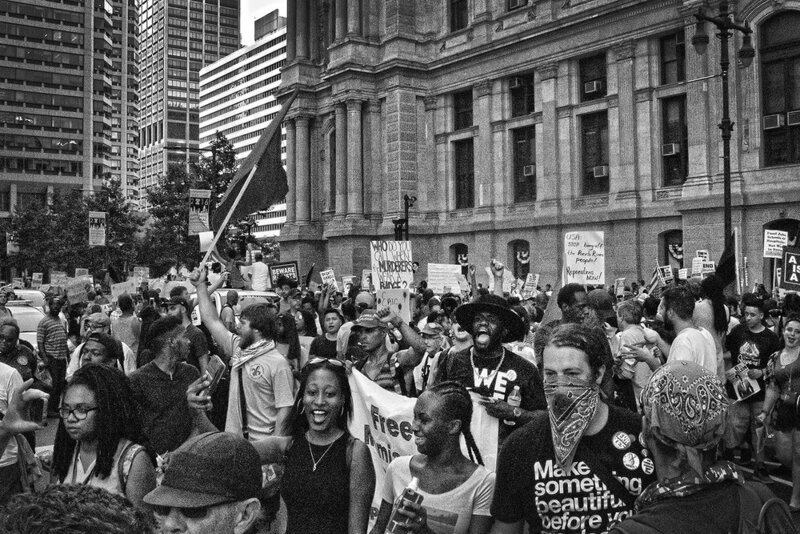 This collection contains photos and videos and podcasts from American Babylon's time at the Democratic National Convention in Philadelphia this summer. Most of these were shot in downtown Philadelphia, the rest are in the surrounding areas. All photos subject to full copyright protection and cannot be reproduced in any way without permission. When Hillary Clinton arrived in Las Vegas for a campaign stop in August, the feeling amongst her attendant supporters was confident, relaxed, nearly jubilant. It would take until the night of November 9th for any real anxiety to set in for many Democratic voters, and by then it was far too late. Donald Trump's October campaign stop in Prescott, Arizona was marked by acrimony, heated disputes and confrontations (several of which became physical) and the presence of a police force which seemed most interested in doing as little as possible to intervene in situations which their own lackadaisical tactics and attitude arguably created. We witnessed and filmed an incident where an elderly woman holding anti-Donald Trump signs was assaulted and her property destroyed. She was arrested in the aftermath. This kind of behavior by police departments is neither rare nor acceptable. Bernie Sanders is not just a Senator from Vermont, a long time Socialist, and a man who surprised everyone (including Bernie Sanders) when he almost, nearly, *just about* but not quite nearly enough won the Democratic nomination for President in 2016. He's also one hell of an orator, in our view. There is something about Bernie, a je ne sais quais that makes him extremely magnetic for people to be around. They react as if he was the long lost Beatle, screaming and rushing the stage and Bernie himself. Whatever you say about Bernie or his promises or politics or the reasons he lost the primary process to Hillary Clinton, he is the most dynamic and arresting of all the politicians we saw in person. You'll know what's happening before we do!